Weapons: He owns many weapons that he has 'found' while exploring and traveling. 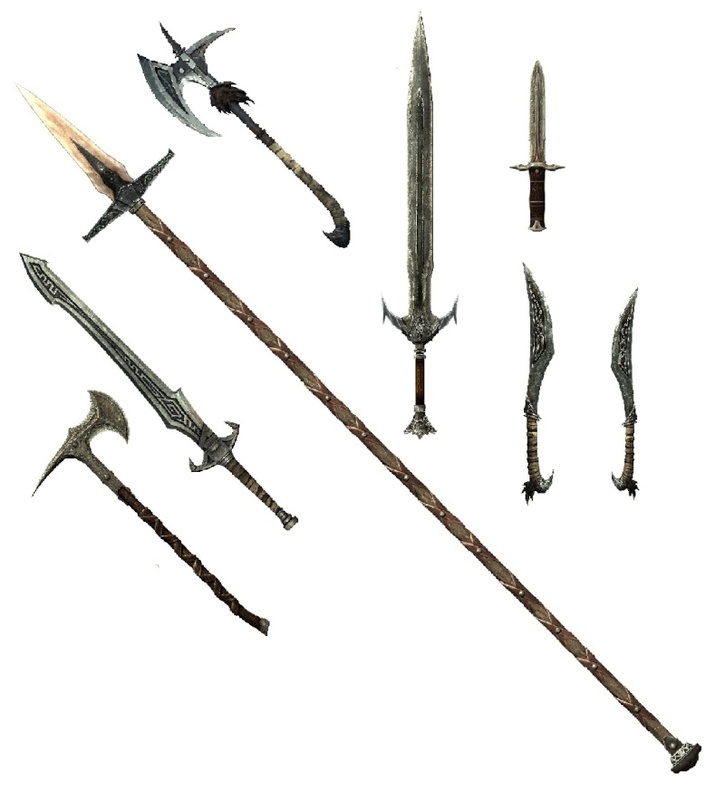 Two swords of very different designs, two very different hand axes, a pair of nearly matched daggers, a simple iron dagger, a short bone spear (6'6" Overall length) A bone bow, and Varied types of arrows made and or scavenged. Clothing: Tattered (very long) leather jerkin, and boots. If he needs it, he does own a leather cuirass, hardened bracers and matching greaves with hidden steel reinforcements, and a studded leather war skirt. On extremely rare occasions he has a simple round shield with pointed studs to add offense to his defense. Quirks: He acts animalistic, not mean, but very animal like. Solitude has made him less trusting and less inhibited. He is however normally noble, albeit it twisted. Skills: He is a skilled archer, and duel weapon fighter. He wields Axes and Swords as easily as Daggers or his spear. He is not very skilled with his shield, but still passable. He has a strong grasp of magic with deep reserves of power, but do to his inability to read knows only a few spells. All of his spells can either be triggered one or two handed, though when both are used the spell powers double in effect. Healing ~ This spell allows the user to regenerate wounds as long as the spell is being cast, it has a moderate 'HP' gain over time. Healing Hands~ This spell is identical to Healing except it allows him to heal others by touching their skin. Flames~ This Spell shoots a constant stream of flame form his finger tips, like a flamethrower. .In short bursts it can be used to light fores, and in longer ones it can be used to super heat steel and cook his enemies alive inside their own armor. Sparks~ This spell is a lightning based spell that works similarly to his Flames spell save it has many effects. First it stuns foes as the electricity courses through them (Like a tazer). Secondly this spell can follow conductive materials which can enhance its effect, but does not let it 'ground out' the same way as mundane electricity. Thirdly this spell also drains the 'mana' or "Magical" reserves of its targets making it harder for them to cast any spells the longer they are under the effects of Sparks. Candle Light~ This spell makes a single immovable pale blue light source that gently flickers as a if candle flame. Telekinesis~ This spell caused another object to be moved by the casters will. Generally used to bring items to the caster. This spell operates identically to an immateriality hand so the caster cannot move more then he can lift. Bound Sword~ This spell summons a ghostly, pale blue sword out of thin air. It is however not illusionary even if weightless. It can only be wielded by the caster, but can be used to cut foes in half with the same ease as a steel one. Cuff of the howling - This artifact allows the wearer to transform into a beast (Giant Wolf). They take on the traits of the animal but retain their intelligence, and powers. Boots of Muffle - Allows the wearer to travel silently even while running. they also mute any sound the wearer would make brushing passed branches or even breaking twigs by stepping on them. But only if said sound was not intentionally made. Bow of Life Ending –This enchantment deals additional bleeding damage to any thing hit by his arrow and creates wounds that will not scab normally for many hours. Also this spell transfers some of the very life force lost to the being that loosed the arrow. However it should give you a clue in to my writing style. Krythe knows nothing of his birth family or how he came to live with the tribe that raised him, though knows that it was not his first home. He was raised by three individuals. An old Breton man, a huntsman and hunter. His wife, an Imperial woman. And of course Skrit, a giant sized wolf magically bound to him. Thadian and Jayna took very good care of the child that wasn't theirs, though Jayna was not around much always elsewhere. Krythe, as they came to call him, took little notice, and less care that she was never there. So even though she had a hand in raising him it was mostly the huntsman Thadian that raised the boy, along with Skrit. For nearly as long as he can remember he has traveled in high places with Thadian, followed everywhere he ever went by Skrit. The old man told him many times that they were blood brothers. And being a child when this first started the kid believed him. Somehow the wolf and he were related by blood. What he doesn’t know is that Skrit's mother attacked and killed both of his parents, and that this woodsmen saved him, but left them to die. Or how after wards his adoptive mother went back and killed the wolf, and all her pups but one. Claiming some kind of divine trade was made that kept the one cub alive, and his former family thinks he is as dead as his mother and father. As he grew he learned that his “mother” Jayna was never around because she was important, and seemed to lead everyone around the camp in some fashion, and he was always with Thadian because the man claimed him as his own son, as some form of replacement for a crime that has never been discussed around Krythe. But as it went by in years Krythe was with his adoptive father nearly ever day learning to hunt, skin, and track. And with Skrit willing to do anything to please Krythe they soon became quite the hunting party with Thadian. And so life passed this way for a long time, hunting, killing. And cleaning their prey to help feed the small tribe they called home and family. Until one day while hunting in the Reach the pair become separated from Thadian for many hours. As they traveled their way among some rocks they were surprised by a cave breaking open underneath them. Thankfully Krythe was not hurt badly enough he couldn't heal them both, but it certainly took time for the simple magic spell to get either of them able to move again. And once able to move, they were trapped with no way for the wolf to climb out. Skrit and he continued through it vary carefully, and were nearly terrified every time they saw one of those old mummified corpses, moving or not. Try as hard as they could they accidentally ended up deeper and deeper in the catacombs and when they worried that there were totally lost they stumbled on a strange curved wall with writings that they did not understand at all. But there nearby they found an ancient tomb carved all over with pictograph’s of wolves and warriors. All normal sense aside and against Skrit's whimpering Krythe pulled nearer and nearer the sarcophagus until he found himself standing in front of it with the lid on the ground from his own pushing. Inside he found a small mantel, folded up and on the corpse of some ancient noble no doubt. It was beautiful and like a fool he grabbed it and shook it out before him for a second before he flipped it around himself and put it on. Suddenly the ancient being came forth and sat up in his coffin causing the boy to fall backwards and spill most of his arrows from the quiver at his hip. “return what you have taken fool” Krythe grabbed up his bow and with the only arrow still in his quiver knocked and drawn he stuttered. “But we, are cold.. and.. and you're dead.” the Ancient thing laughed and continued moving to stand unafraid of the simple barely teen aged boy “then I shall take IT BACK” the thing yelled. Terrified the boy released his grip on the bowstring and the arrow hit the Draugr in the forehead causing it to fall over dead again, but the sound had woken three other former servants of this being and they now slipped their coffin lids to the side. With a terrified glance to Skrit, who was not sure to growl or whimper at this new turn of events, Krythe pulled his small sword out and swallowed hard as his left hand started to glow with fire. Timidly he reached in and took the bracer and cuff, and put them on, waiting for the world to end, or a shade to jump from a shadow or anything to happen. But instead nothing, the Draugr crumbled to dust and he was left alone with Skrit once more. No matter how eerie the scene they made a cold, hungry camp in this room before pressing on again better healed. But while the rested in that darkened room with nothing but the mage-lights glow something else happened. While he was cuddling Skrit and vigorously rubbing his arms he touched the arm cuff and suddenly had fur, fangs, a tail and confusion. Needless to say he panicked, but could understand Skrit, who panicked too. It was many hours before he figured out both to touch the cuff he was wearing again. And how to do it with his muzzle before he was both human, and in awe. Instantly he touched it once, twice, and soon ten times he changed form wolf to man again and again one then the other and he was in awe. When he finally slept it was as a wolf, which was much warmer, and the next day when the cavern door was broken down he was both human again and rescued by Thadian, Jayna and most of the tribe. It would seem that his father had surmised where the hole he fell in lead to, and his Father easily convinced the tribe to come to the boys aid But it was many months before he told anyone about his new arm cuff, and even longer before he told any one exactly how it seemed to work. Since those simpler days Krythe has been 'exiled' from his tribe but for exactly what he does not often say. He now travels the world with Skrit doing all he understands how to do. He hunts, and Stalks game most of the time, selling meats and skins to cities for coin, and when his bravery rises, or his hunger, he adventures into old tombs, dark crypts, and under-explored caverns in search of things to sell. He winters in towns, but spends from Spring to Autumn out exploring and traveling. With nothing to tie him anywhere he never stays in any place for longer than a few seasons before he presses on again. His Bone crafted Bow - Which Grants his Arrows additional damage (Via rapidly bleeding wounds), and drains life from their marks which is returned the the Bows holder. 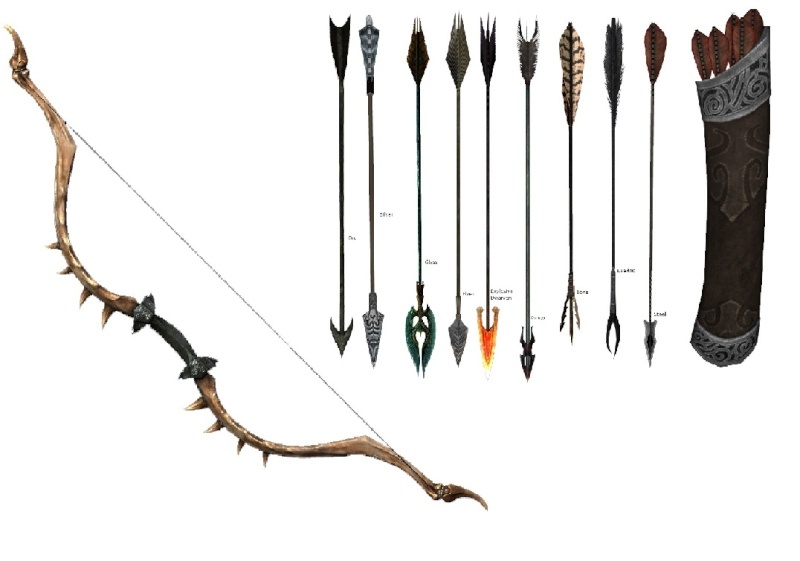 Also pictured are Examples of the Various Arrows in his quiver.